I often struggle with the music at modern churches. It's so loud, I've been known to covertly stick my fingers in my ears so I can hear myself sing, because if I don't I can't even tell if I'm singing in the right key or not. I can't hear anyone around me singing either. Last week I walked in after the call-to-worship music ended on purpose and left before it started again after communion. I just couldn't take it anymore, and I’m not that old. It’s just so loud! Sometimes the drummer is banging loudly to hear himself, the guitarists are strumming louder to hear themselves, the keyboardist can't be heard at all unless he has a solo, and the vocalists are yelling because they don't have the luxury of sticking their fingers in their ears to hear themselves like I do, sitting there in the third or fourth row with no one looking to me for leadership. Adding to the cacophony can be a handful of team members under the age of 18, and they've never learned what it means to be an ensemble. They don't understand their roles as accompanists or harmony carriers, and they are young enough to want their friends and families to hear their playing above the rest. That's understandable, given their inexperience. I could complain. Lots of people in church do. In this case, I have the credentials to do so. My Bachelor's degree is in music (Vocal Performance) from a well-respected conservatory of music. I grew up performing with and studied under the same vocal coach as the actress who holds the most Tony wins in history. I spent a lot of years with colleagues who make their livings on Broadway and in other professional music venues. I've sung on seven different worship teams in seven different churches in four different cities. That's not bragging; that's just backing up my ability to offer constructive criticism. I've done a lot of thinking about this topic, because music is a big deal to me and I am passionate about connecting to God in this way, about worshiping Him by making a joyful noise, and about helping others to do the same. Yet I have found myself in church communities I love, where the gospel is being faithfully preached, where the call to follow Jesus and live as loved is wide open and bold, but I can't say anything enthusiastic about the music. Here’s what I’ve learned: It doesn't matter because music isn't the whole of worship. Somehow here in the culture of the North American evangelical church we have come to understand that worship equals music. When we say, "What's the worship like at your church? ", we mean, unequivocally, "What's the music like?" Music doesn't equal worship, it's a facet of worship. 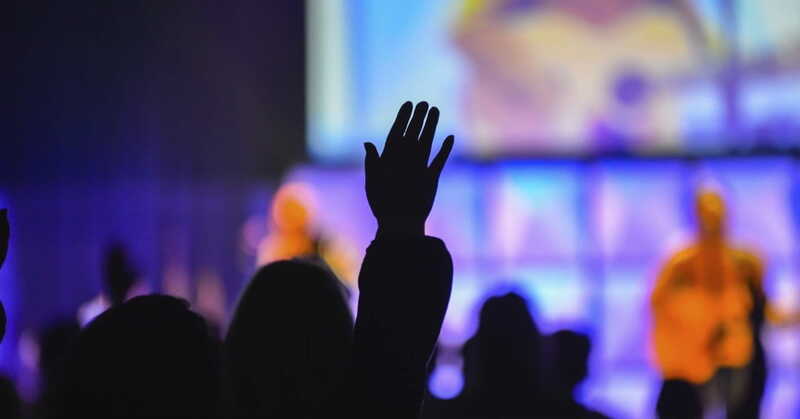 Worshiping God takes any number of forms, from the preaching of the Word to fellowship to communion to confession to verbal, spoken praise to caring for the sick to discipling a new believer. Just check out these Scripture verses on worship. Only one of these 17 verses speaks of singing and music. But obedience is in there, the worship of things other than God is mentioned, and offering ourselves to the will of God is quoted, too. What's true worship of God really all about? God. It's about God. Funny, huh? I think when Paul and Silas were in prison and they had no one to lead them in worship, they sang anyway. When Corrie and Betsie ten Boom were imprisoned in Ravensbruck during World War II, they worshiped God mightily and bravely through their suffering, even while fighting lice and disease and starvation. Our brothers and sisters in the Middle East who this very moment are wondering if their lives here will be taken from them are singing quietly and praying silently and clinging to the hope of the cross. That's worship. It's not unimportant that the music at some churches is really bad. In the life of the church, in the biblical view of corporate worship, singing together is vitally important. I'm not dismissing the lack simply because I love the people. It needs to change. In the meantime, however, I'm asking God to help me worship Him well where He has me, and in the ways that bring Him pleasure. Where is that true for you, too? Your church may have the greatest worship music that ever existed but the weakest sermons ever delivered. Or lack practical outpourings of love and care for each other. Or leave you scratching your head every week over something else that's gotten under your skin. Can you ask God to help you worship Him well where He has you, and in the ways that bring Him pleasure? Because, you know, it's not about us. Kendra Fletcher is a mother of eight, speaker, author, and podcaster. Kendra and husband Fletch produce the popular HomeschoolingIRL podcast (HomeschoolingIRL.com). She also blogs at PreschoolersandPeace.com and KendraFletcher.com. The Fletchers reside in Central California, where they've homeschooled for 19 years, make pizzas in a brick oven, and play in the Pacific Ocean as often as possible.